Hello all! 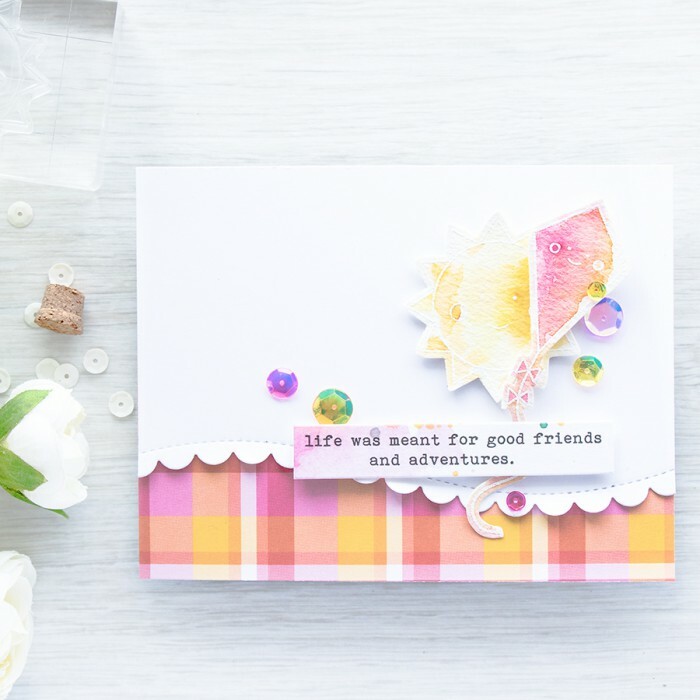 Its that time of the month again – new card kit from Simon Says Stamp is live, yay! Lots of fabulous plaid patterns, fun and playful images – perfect for coloring using your favorite coloring medium and a bunch of sequins in 3 different sizes. What else could a girl want? The inspiration for this card came from the sticker sheet from the kit. 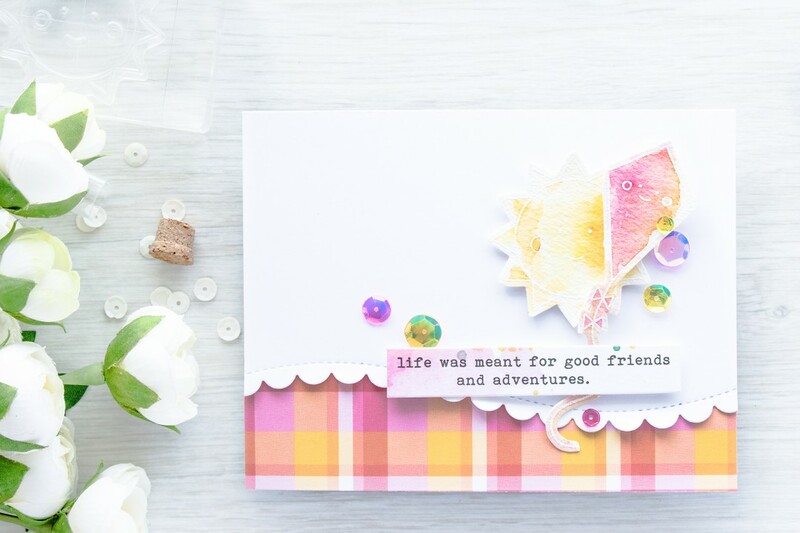 I loved the watercolor puddles and decided to use a similar approach to color a few images for my card. 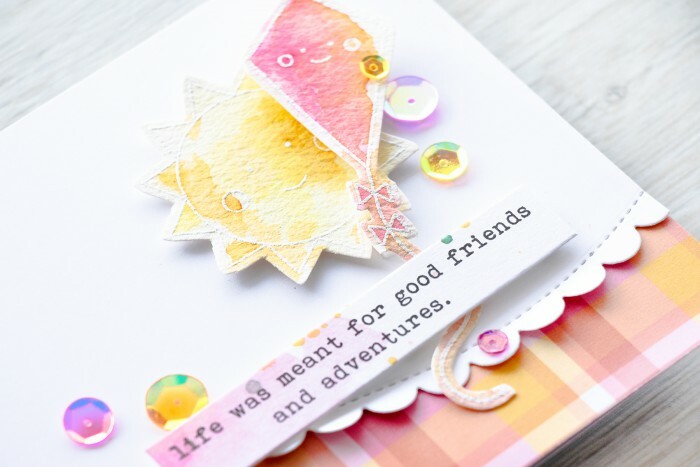 I went with the sunshine and a kite and heat embossed those in white embossing powder onto watercolor paper. Next I wet the paper with clear water and added layers and layers of watercolor ink from the Daniel Smith Watercolor Sampler sheet. I used about 5-6 colors in total (several yellows and several pinks). I fussy cut the images out with my scissor leaving a noticeable border around them. Maybe I should have used a different color of embossing powder to make these move visible, but I do love the way white looks here. I cut a panel out of white cardstock and used a scalloped wavy border die (the largest one) and added a beautiful scalloped border to my white panel. 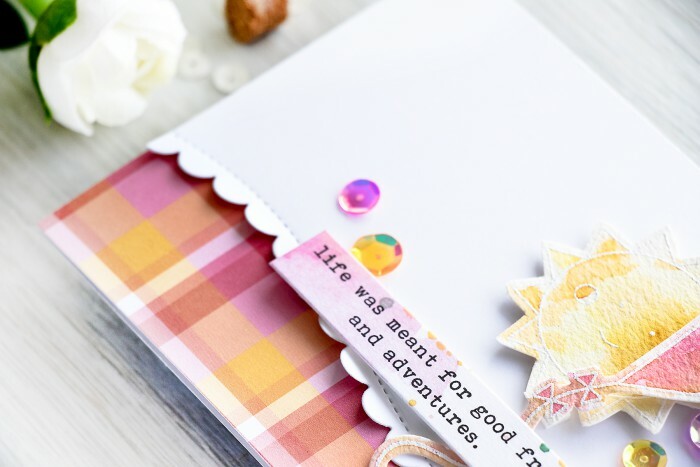 The card base was covered with one of the plaid patterns from the 6×6 paper pad from the kit and the die cut panel was adhered on top. I foam mounted the watercolor images, added a sticker sentiment and finished the card with a sew multi colored sequins. Very pretty Yana. 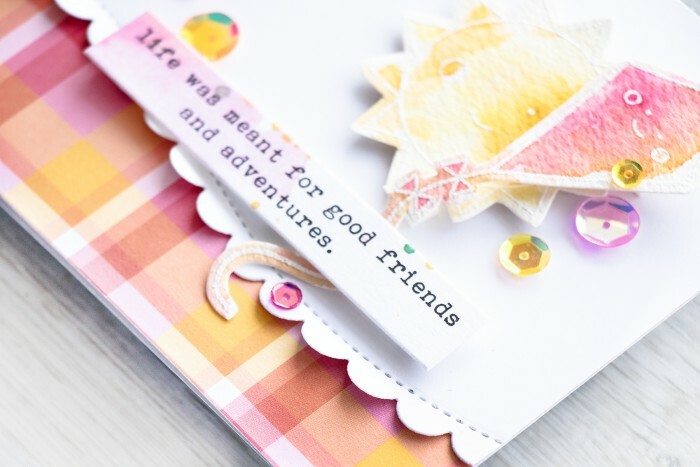 Lawn Fawn’s plaid paper (SO pretty) and the stamps in this kit are great. I really like the scalloped edge on your card. Really sets off the plaid. Yana, I have to say that I love this card but I miss your videos! Hoping to see one soon! Such a sweet card! Its really beautiful! What a fun and happy card! So lovely!